VF-Engineering chose to supercharge the BMW Z3 2.3, 2.5, 2.8 and 3.0 series models to improve throttle response and mid-to-top end power with the centrifugal Vortech supercharger. Maintaining the the original BMW quality, smoothness and reliability were the key factors in the VF design. This is where the VF Hex Flash software comes into full effect. VF has harnessed reliability of Vortech superchargers and quality of VF custom software with over 15 years of supercharging experience and worldwide OEM supply sources to create the ultimate supercharger system for the ultimate driver’s car. This applies to any aftermarket product that does not display a CARB EO#. 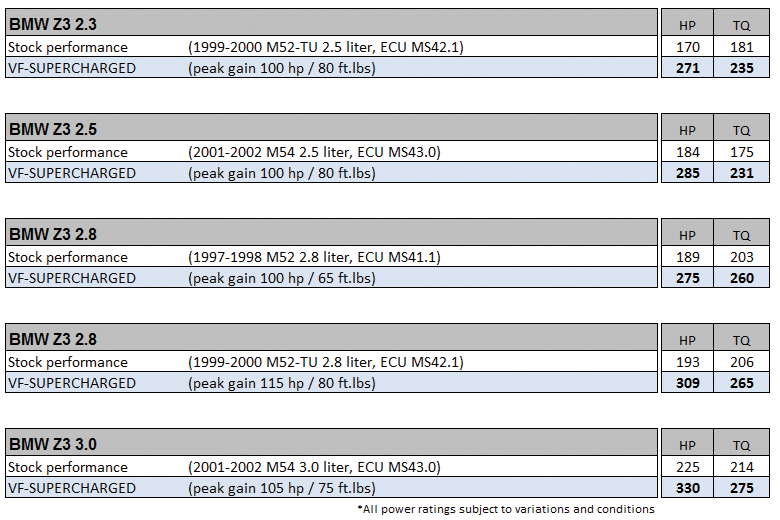 Power ratings are subject to conditions and dynamometer model used.